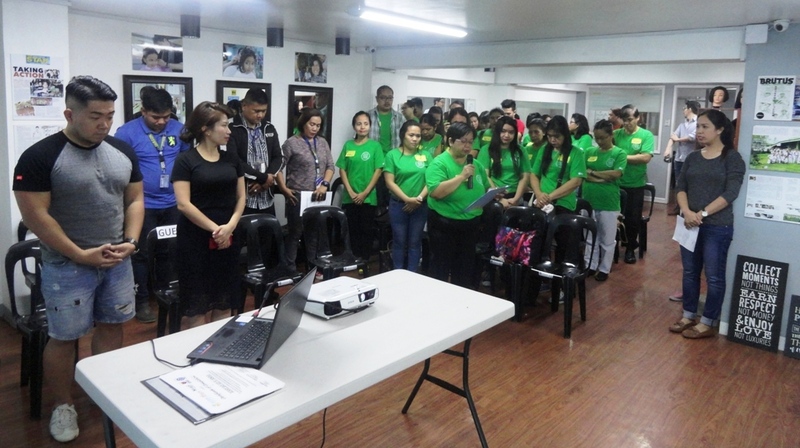 The activity started at 1:30PM, Ms. Victoria Gustilo from the Social Services and Development Ministry (SSDM), led the opening prayer and followed by the welcome remarks given by Mr. Hajime Yokota. He inspired the graduates by sharing his break though experiences how ACTION Inc. started and continues to serve the Filipinos by uplifting their living conditions. After which, a photo presentation of the journey of the 4th batch of massage training was presented. The graduates were happy and proud as they look back on how they started their massage class. They have mixed emotions upon seeing all their pictures. While waiting for the arrival of the guest speaker Coun. Oliviere T. Belmonte, two (2) outstanding students from the batch shared their challenges and experiences in taking the massage course. According to Jerry Jay Ed Amba, 26 year old- “disability is not a hindrance to improve one’s capacity.” Last year, Mr. Amba was diagnosed of having minor pituitary macro adenoma with hydrocephalus (pituitary tumor). He suffered from memory lapses for a time. Fortunately, he is now on a quick process of recovery and that he did not waste his time doing nothing so he decided to join the massage training. Who would have thought that the man who is just recovering from a disability would surprisingly outshine them all. Another outstanding student is Ms. Marlyn De Asis, she was very grateful that she found ACTION Inc. through Ms. Sherly Azucena, an alumna from the 2nd batch of Iyashi Training. Ms. De Asis, is a solo parent and a hardworking mother. She believes that through the skills that she gained from the training, it will help her look for a good employment to sustain the financial needs of her 3 children. 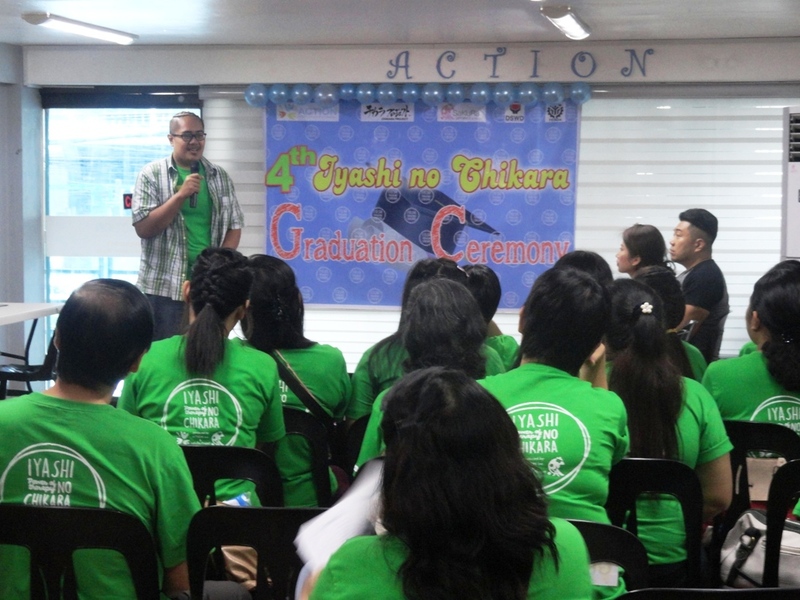 Furthermore, a representative from the Department of Social Welfare and Development- National Capital Region-(DSWD-NCR) under Pantawid Pamilyang Pilipino Program-(4Ps), Mr. Marcel Mendoza-Project Development Officer II, also shared a congratulatory message to all the graduates. He asked the graduates to continue exploring and improving their skills and be an inspiration to other people. 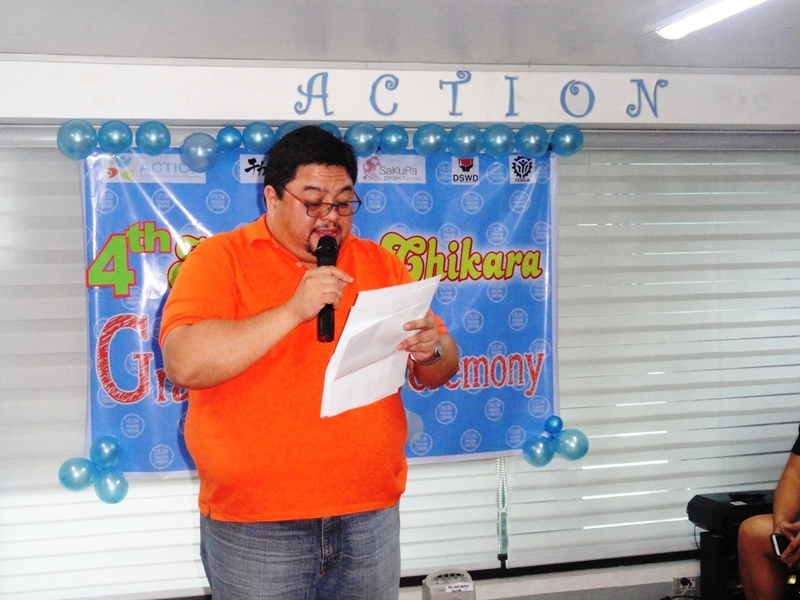 Quezon City Councilor Oliviere T. Belmonte served as the Guest Speaker for the event. His office sponsored the transportation expenses of the two beneficiaries referred by his staff. The good Councilor is aiming to reach out more low income families by providing livelihood program to his covered under privileged urban communities. He is thankful to ACTION for extending its services to his constituents because he believes that more people are in need with this kind of livelihood opportunity. He is looking forward to work hand in hand with ACTION in the future. Right now, they are reviewing the proposed Memorandum of Agreement (MOA) between the Office of Councilor Belmonte and ACTION, Inc.
Twenty (20) participants (4 male and 16 female) passed the final assessment but during the graduation ceremony only 18 (2 male and 16 female) of them attended because the two were sick on that day. A certificate of completion and massage kit was formally awarded by Mr. Hajime Yokota, Mr. Rogelio Apostol, Ms. Miho Ueda and Coun. Oliviere T. Belmonte. Some Special Awards were also given to dedicated students: Mr. Franco De Jesus and Monica Belino were awarded as the Most Punctual, while Jerry Jay Ed Amba, Analyn De Guzman, and Elena Estrada were recognized for having a Perfect Attendance. In addition, three (3) graduates namely Jerry Jay Ed Amba, Marlyn De Asis and Rodemhei Prava were awarded as Outstanding Performers based on the score given during final evaluation. A Certificate of Appreciation was also given to the guest speaker. To formally end the program, a closing remark was given by Ms. Miho Ueda, Project Coordinator of REJOB, the funding agency of Iyashi no Chikara Project. In her closing message, she shared the recently concluded event on Speech Competition which was organized by ACTION in collaboration with Mont Albo Massage Hut and in partnership with the Association of Japan Relaxation Industry (AJRI). The two massage therapist (1 from ACTION and 1 from Mont Albo Massage Hut) winners will be participating in the 4th Annual Speech Competition for Massage Therapists in Tokyo, Japan as guest speech performers on October 27, 2017. With this, she encouraged the graduates to dream big and to continue improve themselves. The second part of the program was the actual massage demonstration. All the guests and ACTION staff were given a relaxing chair massage by the newly graduated massage therapist. Lastly, snacks were served to all the participants. In the meantime, recruitment of applicants for the 5th Batch of Iyashi no Chikara Project is still on-going. For more details, please contact Ms. Janel at cp # 0946-136-5512, landline (02)-376-9498 or email at action.banadera@gmail.com. ← 2017 Zambales Dojo 2nd Karate Promotion, Osu! SUBIZA RESORT’S DANCE-FOR-A-CAUSE FOR ACTION!